Sometimes to get a few minutes of quiet, I give in to the whims of a 1 1/2 year old. And the 6 1/2 year old doesn't mind very much, either. Then we were able to share the end result with our friends at church. I'd say that's a Finer Thing. 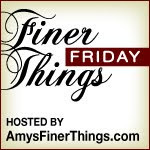 For more Finer Things to be celebrated check out all the links at Amy's Finer Things. 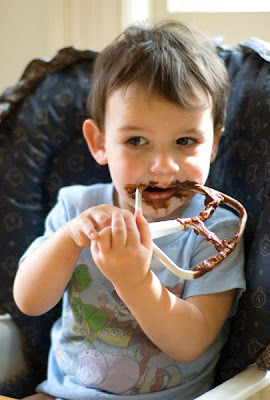 Yep, that would win the best mom ever award here :) It also wins the best wife ever award...dh gets very upset when he sees a mixing bowl with a bit of cake mix or cookie dough already sitting in the sink with soapy water in it! Another reason to never have three kids.... there were usually only two beaters so someone gets jipped!Reason number 8,963 for me! 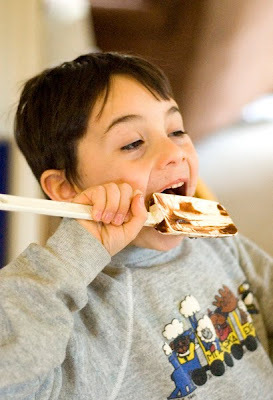 Quando eu era Criança minha mãe me deixava lamber a raspinha da vasilha de massa de bolo rsrsrs também!